In secret of course, without notice. Manifesting the yellow streak down Donald Trump's backbone. For the diplomacy experts witnessing the formal invitations to G.W. Bush last salute, the EU diplomat came in last in the long line of nations. 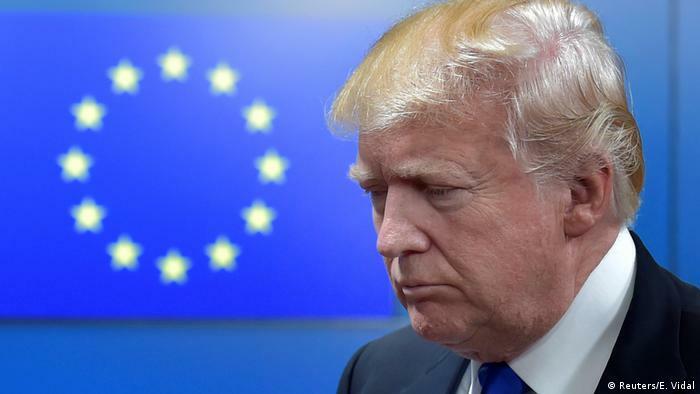 The Trump administration has downgraded the diplomatic status of the European Union's delegation to the United States, an EU official has confirmed to DW. The demotion happened at the end of last year without notice. After the delegation noticed that the EU's Washington ambassador had not been invited to certain events late last year, officials organizing the state funeral for President George H.W. Bush provided final confirmation to EU diplomats that the status of the representation had in fact been downgraded. Diplomats believe the downgrade must have been implemented in late October or early November. At the high-profile event on December 5, as diplomats gathered in Washington to pay their respects, the EU's ambassador to Washington, David O'Sullivan, was not called up in the usual chronological order from the longest-serving to the newest ambassador, said the EU official. "But he was called up as the last person." It's time Europe shows courage and opens the window towards its Eastern neighbour as it has done so often throughout the ages. Especially after BrExit, an island blocking a close relationship to the "foreign" state of the USA. Europe should go forward on the path of its Founding Fathers and work towards peace within, and its closest neighbours on its frontier. No physical walls or fences are needed in a global world bound by the laws of economics, diversity and multilateralism. As former colonial empires, European nations have to show audacity to run its own house without the bonding of NATO and the Military Industrial Complex. EuropeFirst! Stand up to a bully, don't lay down. It's time for "New Europe" to stop its preparation for war with its former foe Russia and turn westward to Old Europe. Much needs to be changed in the corrupt states of the former Soviet bloc before a true partnership exists. The EU funds need to be used in a proper manner for the people and not the leaders and close friends. No surprise, Mr. Trump Europe doesn't like you either! This is part of the implementation of the Joint Statement agreed between Presidents Juncker and Trump in July 2018. In the Joint Statement, the two sides agreed to increase trade in several areas and products, notably soya beans. As a result, the European Commission is now regularly publishing figures on EU imports. These latest significant developments in the second half of 2018 contribute to cementing the U.S.' leading position in supplying the EU with soya beans for the entire calendar year, well ahead of Brazil, Europe's traditional main supplier. In 2018 (January to December), 50% of Europe's imports originated in the U.S. and 36% in Brazil (37% in 2017). European imports of U.S. soya beans are bound to increase even further, following the decision by the European Commission to launch the process for authorising the use of U.S. soya beans for biofuels. Der Drumpfenfuehrer simply doesn't believe the EU is real because it contains a bunch of countries he's never heard of.